Product weight is 45.3 lbs. Professional quality gaming seat for racers, modeled after seats in real World Rally Championship rally cars * Compatible with the Playstation2, Playstation3, Xbox, Xbox 360, Wiki gaming consoles and PCs * Compatibility with most electronic steering wheel and pedal sets * Fully adjustable driving position; integrated side head protection; foldable seat * 250-Pound maximum user weight, 87-Inch maximum length Racing video games have the ability to take us out of our living room and behind the wheel of our favorite race cars on some of the most beautiful tracks in the world. 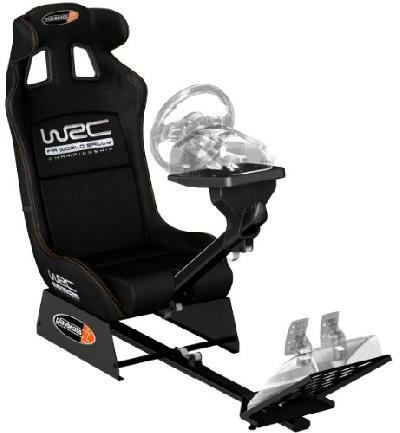 Make that experience even more realistic with the Playseat WRC Gaming Chair! Designed for an authentic gaming experience, the WRC can be used with your favorite PC, Playstation 2, Playstation 3, Xbox, Xbox 360, and Wii racing games. You can combine it with most electronic steering wheel and pedal sets on the market. This quality gaming seat features a replica racing style bucket seat with a fully adjustable driving position. The adjustable steering wheel support provides you with a comfortable customized driving experience. When youre done playing, the WRC folds up for easy storage. Race like the pros with the Playseat WRC Gaming Chair! 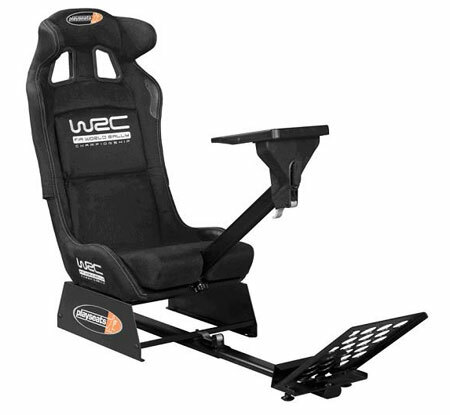 Get the ultimate professional driving simulator experience with the Playseats World Rally Championship racing seat. Featuring several new modifications not found on previous Playseats models, this chair provides ultimate comfort with a unique style to boot. Modeled after the dynamic race seat styling featured in real World Rally Championship rally cars--complete with head stabilizers--it offers thrill-seeking fans a highly realistic experience of what is widely regarded as the most challenging motor sport competition in the world. Features and Specifications: Compatible with the Playstation2, Playstation3, Xbox, Xbox 360, Wii gaming consoles and PC Compatible with most electronic steering wheel and pedal sets on the market Racing Seat: Extra strong, lightweight, powder coated tubular steel racing seat frame with high-tension spring and wire system High-profile side bolsters with ultra high-density foam Fully upholstered in Alcantara Suede fabric with official WRC branding and synthetic leather reinforcements in high-wear areas Removable seat back and base cushions, integrated side head protection Patented foldable system in the back of the seat for easy and fast storageExtra strong, heavyweight, powder coated steel chassis with special oval steel tubing to the pedal support plate and aluminum quick release handle for multi-point adjustment of the gas, clots and break pedal set New patented fully adjustable steering wheel support with aluminum quick release handle for easy adjustment of height and length and universal steering wheel plate for almost all wheels in the market Extra strong, powder-coated triangle tubing with extra space for putting thought all wiring and PU protection between tubes to avoid scratching of the powder coating Fits up to a 42-inch waistRecommended driver length: 47 inches minimum, 87 inches maximum Maximum user weight: 250 pounds Note: Each Playseats product contains everything you need: patented foldable seat; Velcro pads and straps plus screws to securely fix your electronic gaming controllers; assembly tools for a quick build; detailed, easy-to-follow instruction manual; printed manual. Does not include controllers, steering wheels, or foot pedals. This is a review i wrote for a better version of this playseat cockpit but the construction and quality are all the same.This racing seat/cockpit/mount is amazing. I need as much space as i can get, so out of all the available cockpits that are on the market now, none can be as compact as this. Not saying that it doesnt extend for us tall people, im 6'3" and ive got room to grow in this seat. I find the seat to be a little snug and not have much back support, but i doubt your gonna be sitting in this for ov.. The Mad Hatta - See all..
A pleasant surprise: The seat worked just as promised, and just as good as the other reviewers said. The wheel I am using is the new Fanatec GT2 wheel and the clubsport pedals.Assembly:The unit assembled with little difficulty. All of the parts and tools are included. The items were wrapped well and NO scratches on anything! I would say it took abut 15 minutes to assemble and faster if you have a ratchet driver. The upholstery on the seat smoothed better than I thought a folding design would, and the fasten..
LT. John - See all my r.. I have had my Playseat WRC for about 4 months now and can say it was worth every penny. Extremely comfortable, even for those multi-hour Gran Turismo endurance races. Solid feeling when you are in the unit -- I had my doubts about the pressure locks when I first got it and can say that the unit does not move a bit during play, even with multiple drivers rotating through 7 hours of Suzuka in the rain.Getting in and out of the seat can be challenging, especially with the optional gear shift holder in place. T..
kkalp77 "kalper" - See ..